LONG ISLAND CITY, N.Y., Jul. 12 /CSRwire/ - UNFCU announced today that it has become a carbon neutral organization. Only one other credit union in the US with assets of more than $4 billion has achieved this status. 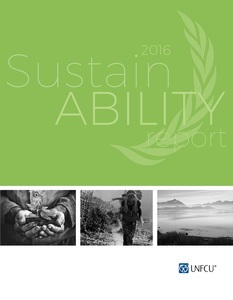 Carbon neutrality - which mitigates impact on global climate change by reducing net organizational greenhouse gas emissions to zero - is one of eight goals that UNFCU outlines in its first sustainability report covering its strategy, initiatives, and progress in 2016. Going forward, UNFCU will focus on the 5 year sustainability plan it has developed to guide its environmental performance improvements through 2020. “We are proud of UNFCU for demonstrating active engagement in sustainability and transparency,” said Shoa Ehsani, Sustainability & Climate Neutral Strategy Officer, United Nations Environment Program, UNEP-Nairobi, and a focal point for the Sustainable UN (SUN) Team at Greening the Blue, an international movement of UN entities focused on the organization’s climate neutrality. UNFCU’s efforts reinforce its commitment to its members to operate as a good corporate citizen of the world and are aligned with the UN Sustainable Development Goals (SDGs). The report draws from best practices in the Global Reporting Initiative (GRI) G4 Guidelines. It includes among other data, environmental sustainability performance metrics that have been independently reviewed by sustainability experts from Envision Realty Services and Kosmenko & Co.
UNFCU offers a full suite of banking products and services designed for the mobile lifestyle of the global UN community. Headquartered in New York, UNFCU was founded in 1947 by 13 UN staff members. Today, UNFCU has more than 127,000 members worldwide and is one of the 35 largest credit unions in the US with representative offices in Austria, Italy, Kenya, and Switzerland. UNFCU launched its Global Sustainability Program in 2015 with nearly 40 staff volunteers.